Definition at line 58 of file llscrollcontainer.h. Definition at line 63 of file llscrollcontainer.h. Definition at line 72 of file llscrollcontainer.cpp. References LLView::addChild(), init(), and mScrolledView. Definition at line 94 of file llscrollcontainer.cpp. Definition at line 157 of file llscrollcontainer.cpp. References i, mScrollbar, mScrolledView, NULL, S32, and SCROLLBAR_COUNT. Definition at line 432 of file llscrollcontainer.cpp. References FALSE, LLViewBorder::getBorderWidth(), LLRectBase< Type >::getHeight(), LLRectBase< Type >::getWidth(), mBorder, LLView::mRect, S32, SCROLLBAR_SIZE, and TRUE. Definition at line 426 of file llscrollcontainer.cpp. 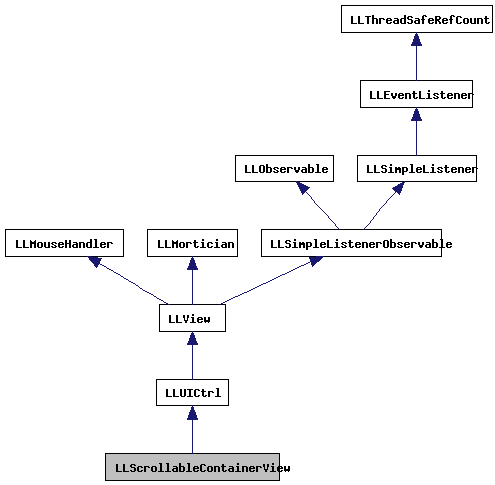 Referenced by LLFolderView::arrange(), draw(), reshape(), LLFolderView::reshape(), scrollToShowRect(), LLFolderView::startRenamingSelectedItem(), and updateScroll(). Definition at line 462 of file llscrollcontainer.cpp. References AUTO_SCROLL_RATE_ACCEL, calcVisibleSize(), LLFocusMgr::childHasKeyboardFocus(), LLView::drawChild(), LLView::drawDebugRect(), FALSE, LLUICtrl::focusFirstItem(), LLView::getChildList(), LLFrameTimer::getFrameDeltaTimeF32(), LLView::getRect(), LLView::getVisible(), gFocusMgr, gl_rect_2d(), glColor4fv, LLView::hasMouseCapture(), HORIZONTAL, llmin(), mAutoScrolling, mAutoScrollRate, MAX_AUTO_SCROLL_RATE, mBackgroundColor, mBorder, LLRectBase< Type >::mBottom, MIN_AUTO_SCROLL_RATE, mInnerRect, mIsOpaque, LLRectBase< Type >::mLeft, mScrollbar, mScrolledView, LLColor4::mV, S32, SCROLLBAR_SIZE, LLView::sDebugRects, LLView::sDepth, LLViewBorder::setKeyboardFocusHighlight(), updateScroll(), and VERTICAL. Definition at line 763 of file llscrollcontainer.cpp. References LLUICtrlFactory::createCtrlWidget(), LLView::createRect(), FALSE, LLUICtrlFactory::getAttributeColor(), llendl, llinfos, LLScrollableContainerView(), mScrolledView, LLPointer< Type >::notNull(), LLRectBase< Type >::null, and NULL. Definition at line 730 of file llscrollcontainer.cpp. Definition at line 91 of file llscrollcontainer.h. Definition at line 79 of file llscrollcontainer.h. Definition at line 78 of file llscrollcontainer.h. Definition at line 741 of file llscrollcontainer.cpp. References LLView::getXML(), mBackgroundColor, mIsOpaque, mScrolledView, LLColor4::mV, and TRUE. Definition at line 725 of file llscrollcontainer.cpp. References mScrollbar, LLScrollbar::setDocPos(), and VERTICAL. Definition at line 720 of file llscrollcontainer.cpp. Definition at line 318 of file llscrollcontainer.cpp. References ACCEPT_NO, LLView::childrenHandleDragAndDrop(), FALSE, LLScrollbar::getDocPos(), LLScrollbar::getDocPosMax(), LLFrameTimer::getFrameDeltaTimeF32(), LLRectBase< Type >::getHeight(), LLView::getVisible(), LLRectBase< Type >::getWidth(), HORIZONTAL, llround(), mAutoScrolling, mAutoScrollRate, LLRectBase< Type >::mBottom, mInnerRect, LLRectBase< Type >::mLeft, LLRectBase< Type >::mRight, mScrollbar, LLRectBase< Type >::mTop, NULL, LLRectBase< Type >::pointInRect(), S32, SCROLLBAR_SIZE, LLScrollbar::setDocPos(), TRUE, and VERTICAL. Definition at line 239 of file llscrollcontainer.cpp. References FALSE, LLView::getParent(), LLView::getVisible(), LLView::handleKey(), i, LLView::mEnabled, mScrollbar, mScrolledView, S32, SCROLLBAR_COUNT, and TRUE. Definition at line 279 of file llscrollcontainer.cpp. References i, LLView::mEnabled, mScrollbar, S32, SCROLLBAR_COUNT, and TRUE. Definition at line 395 of file llscrollcontainer.cpp. References FALSE, LLView::getRect(), LLView::getVisible(), LLView::handleToolTip(), i, LLRectBase< Type >::mBottom, LLRectBase< Type >::mLeft, mScrollbar, mScrolledView, LLView::pointInView(), S32, SCROLLBAR_COUNT, and TRUE. Definition at line 113 of file llscrollcontainer.cpp. References LLView::addChild(), LLViewBorder::BEVEL_IN, FALSE, LLRectBase< Type >::getHeight(), LLRectBase< Type >::getWidth(), LLScrollbar::HORIZONTAL, HORIZONTAL, HORIZONTAL_MULTIPLE, mBorder, LLRectBase< Type >::mBottom, mInnerRect, LLRectBase< Type >::mLeft, LLView::mRect, LLRectBase< Type >::mRight, mScrollbar, LLRectBase< Type >::mTop, NULL, SCROLLBAR_SIZE, LLRectBase< Type >::set(), LLView::setFollowsBottom(), LLView::setFollowsLeft(), LLView::setFollowsRight(), LLView::setFollowsTop(), LLUICtrl::setTabStop(), LLView::setVisible(), LLRectBase< Type >::stretch(), LLScrollbar::VERTICAL, VERTICAL, and VERTICAL_MULTIPLE. Definition at line 298 of file llscrollcontainer.cpp. References FALSE, LLScrollbar::getDocPos(), LLRectBase< Type >::getHeight(), LLView::getVisible(), LLRectBase< Type >::getWidth(), mInnerRect, mScrollbar, S32, SCROLLBAR_SIZE, and TRUE. Definition at line 715 of file llscrollcontainer.cpp. References mScrollbar, LLScrollbar::pageDown(), and VERTICAL. Definition at line 710 of file llscrollcontainer.cpp. References mScrollbar, LLScrollbar::pageUp(), and VERTICAL. Definition at line 213 of file llscrollcontainer.cpp. References calcVisibleSize(), FALSE, LLViewBorder::getBorderWidth(), LLRectBase< Type >::getHeight(), LLView::getRect(), LLRectBase< Type >::getWidth(), HORIZONTAL, mBorder, mInnerRect, LLView::mRect, mScrollbar, mScrolledView, LLView::reshape(), S32, LLRectBase< Type >::set(), LLScrollbar::setDocSize(), LLScrollbar::setPageSize(), LLRectBase< Type >::stretch(), and VERTICAL. Definition at line 189 of file llscrollcontainer.cpp. References LLView::getRect(), mInnerRect, LLRectBase< Type >::mLeft, mScrolledView, S32, and LLView::translate(). Definition at line 641 of file llscrollcontainer.cpp. References calcVisibleSize(), FALSE, LLScrollbar::getDocPos(), LLRectBase< Type >::getHeight(), LLView::getRect(), LLRectBase< Type >::getWidth(), HORIZONTAL, llclamp(), llendl, llmax(), llmin(), llwarns, LLRectBase< Type >::mBottom, LLRectBase< Type >::mLeft, LLRectBase< Type >::mRight, mScrollbar, mScrolledView, LLRectBase< Type >::mTop, LLCoord::mX, LLCoord::mY, S32, LLScrollbar::setDocPos(), LLScrollbar::setDocSize(), LLScrollbar::setPageSize(), updateScroll(), and VERTICAL. Definition at line 201 of file llscrollcontainer.cpp. References LLView::getRect(), mInnerRect, mScrolledView, LLRectBase< Type >::mTop, S32, and LLView::translate(). Definition at line 635 of file llscrollcontainer.cpp. Definition at line 90 of file llscrollcontainer.h. Referenced by LLFloaterPermissionsMgr::LLFloaterPermissionsMgr(), and LLInventoryPanel::postBuild(). Definition at line 75 of file llscrollcontainer.h. Referenced by LLFloaterCustomize::initScrollingPanelList(), and LLFloaterNetwork2080::LLFloaterNetwork2080(). Definition at line 77 of file llscrollcontainer.h. References mInnerRect, and LLRectBase< Type >::setValue(). Definition at line 553 of file llscrollcontainer.cpp. References calcVisibleSize(), FALSE, LLViewBorder::getBorderWidth(), LLRectBase< Type >::getHeight(), LLView::getRect(), LLRectBase< Type >::getWidth(), HORIZONTAL, mBorder, LLRectBase< Type >::mBottom, mInnerRect, LLRectBase< Type >::mLeft, LLView::mRect, mReserveScrollCorner, mScrollbar, mScrolledView, LLRectBase< Type >::mTop, r, LLScrollbar::reshape(), S32, SCROLLBAR_SIZE, scrollHorizontal(), scrollVertical(), LLScrollbar::setDocPos(), LLScrollbar::setDocSize(), LLScrollbar::setPageSize(), LLView::setRect(), LLView::setVisible(), LLView::translate(), TRUE, and VERTICAL. Referenced by draw(), and scrollToShowRect(). Definition at line 130 of file llscrollcontainer.h. Referenced by draw(), and handleDragAndDrop(). Definition at line 131 of file llscrollcontainer.h. Definition at line 126 of file llscrollcontainer.h. Definition at line 128 of file llscrollcontainer.h. Referenced by calcVisibleSize(), draw(), getBorderWidth(), init(), reshape(), setBorderVisible(), and updateScroll(). Definition at line 127 of file llscrollcontainer.h. Referenced by draw(), handleDragAndDrop(), init(), needsToScroll(), reshape(), scrollHorizontal(), scrollVertical(), setValue(), and updateScroll(). Definition at line 125 of file llscrollcontainer.h. Definition at line 129 of file llscrollcontainer.h. Referenced by setReserveScrollCorner(), and updateScroll(). Definition at line 122 of file llscrollcontainer.h. Referenced by draw(), goToBottom(), goToTop(), handleDragAndDrop(), handleKey(), handleScrollWheel(), handleToolTip(), init(), needsToScroll(), pageDown(), pageUp(), reshape(), scrollToShowRect(), updateScroll(), and ~LLScrollableContainerView(). Definition at line 123 of file llscrollcontainer.h. Referenced by calcVisibleSize(), draw(), fromXML(), getScrolledViewRect(), getXML(), handleKey(), handleToolTip(), LLScrollableContainerView(), reshape(), scrollHorizontal(), scrollToShowRect(), scrollVertical(), setScrolledView(), updateScroll(), and ~LLScrollableContainerView(). Definition at line 124 of file llscrollcontainer.h.